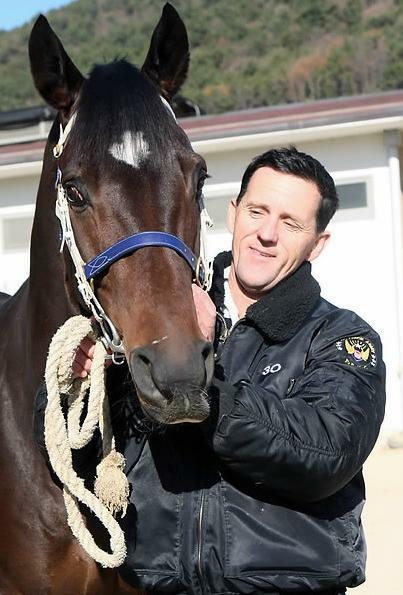 Peter Wolsley started training at Busan just before Christmas in 2007, becoming the first westerner to take up a license in Korea. When he first arrived, he wasn’t given much to train, getting the ones no-one else wanted. In early 2008, a 3-year-old colt arrived in his barn. Initially, this one wasn’t exactly the second coming of Phar Lap. He “ran” 5 furlongs in 70 seconds in his first official race-trial and therefore failed to qualify. The colt was given another chance the following month and this time he came through. Since then Khaosan [Sunday Well – Mogaung (Jade Hunter)] hasn’t looked back. Today at Busan, Khaosan, now 8-years old (and gelded) made his 50th start for Wolsley and the tough, battling horse held off a class 1 field to record the 9th win of his career. Those 9 wins don’t tell the whole story though. Khaosan has also finished 2nd 11 times and 3rd on 8 occasions becoming a punters’ favourite for their quinella slips in the process. He has a Stakes victory – trainer Wolsley’s only one to date – to his name, winning the 2011 Owners’ Cup after Cheonnyeon Daero was disqualified. He backed up that performance a month later by travelling to Seoul and finishing 4th in the President’s Cup, Korea’s richest race. Indeed, he has only finished outside the money 7 times, winning nearly $1Million in total prize money. Khaosan has also been a great friend to visiting foreign jockeys. Danny Craven, Deryl Daniels, Martin Wepner, Kunihisa Hirase, the late Yoshi Aoki, Nathan Stanley, Gerrit Schlechter and Joe Fujii have all ridden him to prize-money finishes over the years. Always likely to find at least one or two faster than him in the very biggest races, there will be fewer who are gamer or more consistent or sound. Indeed, his only significant time away from the track were the 5 months in 2009 during which he had the operation that means there will be no Khaosan Juniors once his racing days are done. His first by actually crossing the line in first place since April 2010. Khaosan is not a fast horse but he is tough and sound – he’s run fourteen times this year – and thrives on the Busan sand.